After listening to Jeanette Fitzsimons explaining her resignation from parliament on RNZ it would not surprise me if the National government finds something meaningful for her to do - perhaps on the board of the EECA which is a Green Party legacy from the Fifth Labour government most closely associated with her personally. The notion that Gerry Brownlee, Minister of Energy, may appoint her will sound preposterous given his lambasting of the Greens and everything they stand for; but this is the same government that appointed Nandor Tanczos to the Arts Board on the strength of running the Hempstore so anything is possible. The PM's statement is generous, if a little lacking in specifics. Fitzsimons was always seen as more green than red in her politics and her focus. 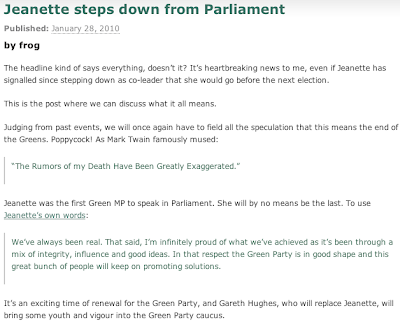 Her well telegraphed retirement from the House (following her well planned exit from the co-leadership) is something that Green Party critics claim as proof of the party having slipped its environmental leash and evidence that it has now bolted down the path to a Socialist hard-left niche party of unreformed communists. With Locke, Kedgely and Turei forming the rump (Norman isn't "hard" anything so he's not in this camp) it is easy to see why they might think that. Maybe it's a good thing to be Left in this day and age? It's not as if they will have any competition. Some might argue that with Phil Goff's pandering to the conservative Pakeha voters a hard left brand has the potential to eat into the Labour vote - especially the urban liberals who have never seriously questioned the environmental part, but have usually voted Labour because of the commitment to delivering what they would call decent socially progressive policies. Such policies are in doubt with a Goff-run outfit floundering in a mire of directionless, reactionary talkhate radio themes. The Greens have lost a very steady hand at their tiller, but have now - perhaps - the best chance of making inroads to the Labour heartland. Having some fresh faces in front of the voters is helpful. The next on the list and a new MP next month, is the 28 year old Gareth Hughes. Looks more like 18! Don't they all when you're over 30. There's a lot to live up to for any new Green MP. They are parliamentary over-achievers, racking up more policy wins and legislation than most ministers - quite extraordinary seeing as they have never been in government. "The Greens have lost a very steady hand at their tiller, but have now - perhaps - the best chance of making inroads to the Labour heartland"
Most working class labour voters (the labour heartland) don't want to have anything to do with the Greens. There is nothing in common with the two so how you make any connection between the two is beyond me. where is the pretty Green party dude. NZ Nat party stealing your thunder. Next election Green = 4%. Oh Lordie that child has had a child? Idealistic clap trap from yet another someone who has never held down a job for more than 5 minutes. Who is next when Sue Special K chucks in her toys?